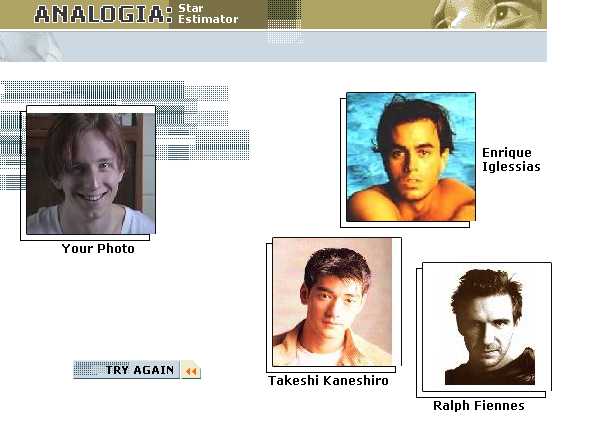 I found a link to this site that supposedly finds who your celebrity look-alike is using patern-recognition software. My results were pretty funny. Who is your celebrity look-alike? So here we have a supposed Christian classifying an entire people group as sub-human and praying violent deaths for them. It would be ironic if it weren't so disgusting. Disgusting, and very very saddening. Sorry to leave this post on a downer note like that, but I was left pretty speechless by that. Not that anything else would really “lighten” this post up, now. This guy sounds more like a muslim than a Christian, maybe he should look into it. He seems to have the mentality. In fact I'm pretty sure i recognize most of that from Osama's address that he sent to the US. Man... don't you read Discover??? An elevator(using carbon nanotube cables and powered by several photovoltaic lasers) into space is the cheapest(and frickin' coolest) way to go. Build it once for a few billion bucks... instant access to space, anytime. Well... in a few hours. Heh. Also... Looks like someone's been taking that “sons of Ishmael” verse a little too much to heart. That web site is funny. I got Denzel Washington, Elijah Wood and Michael Owen, a football (soccer) player from the U.K.
i guess i need to stop hoping for peoples' violent deaths in the name of the Father, too ..